Anyone who’s looked up legal terms on ProZ term search in the Spanish-to-English combination will probably be familiar with Rebecca Jowers. You’re likely to remember her because although she may not be the most prolific contributor, she’s definitely one of the most authoritative. This is obvious from her answers, which bear the mark of someone with a wealth of knowledge and experience who obviously thinks long and hard about legal translation. 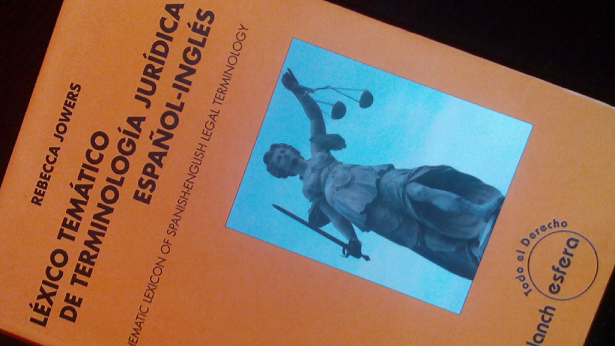 Well, she’s finally dumped all that knowledge in a book: Thematic Lexicon of Spanish-English Legal Terminology. Another thing you see in the author’s ProZ answers is her no-nonsense approach to finding the right term. Where others might falter, she quickly pushes aside close-but-no-cigar authentic terms or would-be functional equivalents to make way for descriptive translations that fully get the meaning across. She has no qualms about nuancing existing terms into descriptions that ensure target-language readers will get the picture. You also get all this in her dictionary. 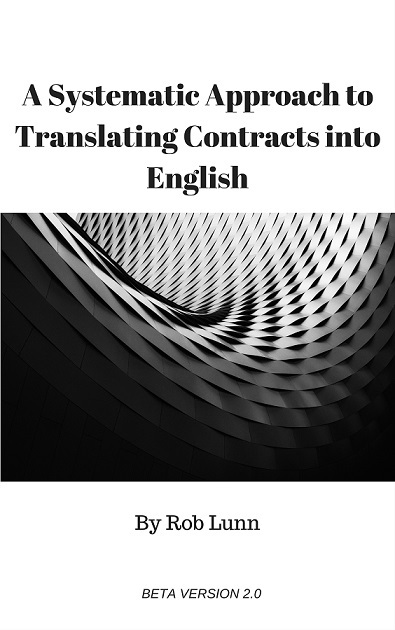 Translators and legal professionals who use this lexicon will have to decide whether the suggested translations are appropriate in the specific context in which they work and may likely develop other translations that do not necessarily coincide with mine. p. 21. Indeed, learning how to adopt such an approach from the book may be even more valuable than having the terms in it at your disposal. This resource will be useful for Spanish-to-English translators. But be warned. It’s not set out like your typical bilingual dictionary and requires a little more work to locate the excellent information in it. At least that has been my experience. This is because it is organised by subject. This is more efficient than listing by alphabetical order because it removes the need for providing context in many cases. The fact that a term is in a particular section inherently provides the context. A big plus. One of the problems with traditional dictionaries is that it is often hard to know whether a term is right for your context. The arrangement in this lexicon removes a lot of that doubt. Particularly as the author often provides whole sentences (and the translations to them). The downside to this arrangement is that things are harder to find. Even when you know exactly what area of law you’re talking about, which should be most of the time, you have to find or know the subsection the term comes under and then find or know exactly where the term comes in the subsection itself because terms are not listed alphabetically — at least not throughout the whole subsection. This is a little frustrating and wastes time. You have to check the entire subsection to find out if a word is not listed. I assume the criteria was to put the most important terms first, but I think alphabetical listing would have been better for the terms in the subsections. So you have to know your way around this dictionary to get the best results from it when translating. It’s ideal as a research companion and for improving your knowledge but a bit hamstrung for looking up terms on the fly for the first time. The content is very thorough. For the areas covered, extensive in itself, very few stones seem left unturned. However, seeing its thoroughness got me thinking about one of the drawbacks of using bilingual dictionaries for translating specific types of documents. Here I’m thinking about contracts and in particular those formulaic patches of language you find in them. It may be a trap to have translations for every little section and sentence because it is often better to rely on other criteria for working out the best translations for such language. But I am digressing onto a topic for another day. A thorough dictionary is a good one. We just have to know how to use it and heed the author’s reminder to make sure her suggestions fit the context. So a recommendable resource, both for its quality and coverage and also its unique arrangement and sensible approach to term research and in particular to translating non-equivalent language. I, at least, am a fan. Thanks for this review, Rob. I wanted to ask, is it the type of book you would sit down and read cover to cover (albeit, bit by bit)? I would prefer to buy an electronic copy, which I guess would make it easier to look things up, although it doesn’t seem to currently be available in electronic format. Hi Gwen! Yes, I suppose some sort of systematic reading would be a good learning exercise. Particularly if you did it alongside some other study in the same area. Although given its length, 1000 pages, that’s a project I’d set off on just for the journey’s sake. 🙂 Even then I don’t think you’d need to read all of each section — just the bits that look interesting or that you know are problematic based on other research. And yes, an e-version would be handy.